What is Solgar PM PhytoGen Complex? Solgar PM PhytoGen Complex is a menopause supplement from the Solgar Corporation which makes a variety of supplements. Phytoestrogenic Ingredients For Hot Flashes Estrogen deficiency during menopause causes hot flashes. Solgar PM PhytoGen Complex has isoflavones which are weakly estrogenic plant compounds. Progesterone and/or Progesterone Precursors Progesterone balances out estrogen and is essential when supplementing the body with estrogen. Solgar PM PhytoGen Complex does not address progesterone deficiencies. No artificial dyes No titanium dioxide. Solgar PM PhytoGen Complex has Pueraria mirifica which is rich in phytoestrogens. It only addresses one cause of menopause, low estrogen levels and does not address progesterone deficiencies. Does Solgar PM PhytoGen Complex Work? As we have mentioned, Solgar PM Phytogen only addresses estrogen levels. Therefore, it only addresses hot flashes and night sweats. Is Solgar PM PhytoGen Complex Safe? Solgar does not have progesterone-raisers to address the second cause of menopause. We would be more worried about whether or not it works. 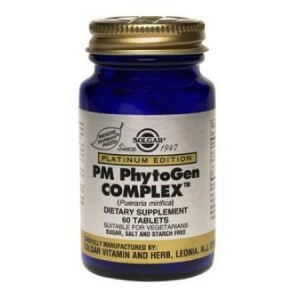 I have been using PM PhytoGen for 3 months and still have hot flashes although they are not as severe and don’t last as long as they used to . Also, my “cold” flashes have diminished. I am still trying to find the perfect natural remedy for my flashes. I take an i-cool w/my morning meal, and the PM PhytoGen COMPLEX w/noon and evening meals. My sleep has improved immensely; just minimal waking up once or twice with sweating or hot flashes that don’t hold a candle to what I was experiencing before. Alone, i-cool had no effect on me, but all are natural ingrediants and safe to take w/each other so I continued them and since it is working fairly well I will continue to do so. I have been taking PM Phytogen for about a month. I’m experiencing higher blood pressure readings which is causing warmth in my face and dull headaches. I’m wondering if it could be caused from the phytogen?